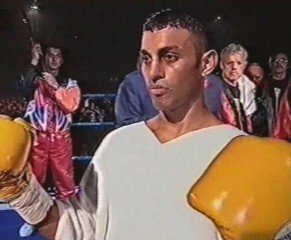 Back in April of 2001, “Prince,” Naseem Hamed, then sporting a perfect 35-0 record, faced “The Baby Faced Assassin,” Marco Antonio Barrera, then holding a 52-3 pro ledger in one of the biggest featherweight fights in recent history. What took place in the ring proved memorable. The showdown, at The MGM Grand in Las Vegas, was widely expected to provide another exciting knockout night for “Naz” – instead we saw a would-be great humbled almost to the point of retirement. Who can forget the way Hamed, by now trained by the great Emanuel Steward, took so long in coming out of his dressing room for battle? A good fifteen or twenty minutes passed before Barrera, who had made his way to the ring with no fuss at all, was joined by the U.K superstar who was attempting to gain similar status in America. On the way to the ring, carried in as he was by a huge, sort of hoop/swing that held him aloft, Hamed was pelted by unimpressed fans, who threw beer over the deeply religious, non-drinking Muslim. The irony was not lost! What was lost, though, was the familiar sight of Hamed flipping headfirst into the ring. On this night, unhappy with the ropes, Hamed declined to treat us with his trademark. Was this, along with the inordinately long amount of time it took for him to make an appearance, proof that Hamed had lost his usual self confidence? Once the bell for round-one rang, Hamed surely lost his poise. Belted so hard he was lifted clean off the canvas, the 27-year-old was saved only by his amazing ability to take a shot and recover. There was a time, though, when Hamed was almost impossible to hit cleanly. Not any more. Months of declining to put in the hard work in training, instead opting to rely on his withering punch power to get the job done, had taken their toll on Naz’ skills. And how the supremely experienced former three-time WBO super-bantamweight champion took advantage. The infringement cost Barrera a point, but he knew he could afford it. To his credit, Hamed, though beaten soundly, was not thrashed, as some later rethinking of the fight claims. The unanimous decision loss hurt badly, however, and Hamed’s incredible faith in his talents all but disappeared. So too did Hamed, who was not seen in a ring for over a year. After the “comeback” win, a dull points win over Manuel Calvo – in a fight that had none of the old Hamed excitement or theatrics, to the point where fans left the arena before the fight’s conclusion – Hamed disappeared for good. “The Prince” never did announce his retirement officially, but looking back – Barrera, that night in Vegas, took away Hamed’s desire to ever want to fight the best again. Sometimes one fight is all it takes to totally alter a boxer’s confidence. This fight is a classic example.